The PDA market these days is often overlooked and labeled as stagnant, with handhelds often seen as unproductive novelties instead of the highly efficient organizers they were originally intended to be. However, while the goal of a multifunctional organizer might have been in the minds of the concept artists who designed the first PDA models, handhelds have evolved drastically, largely surpassing what they were first intended for. Indeed, the competition for handhelds has undergone several major developments since Casio introduced the first Palm powered PDA in 1993, a half-functional unit called the �Zoomer� with basic Graffiti, address book, and alert functions. Immediately afterwards, the big boys (HP, Apple, and Sharp) rolled out their own electronic organizers and operating systems. However, within the course of a few years, Palm�s efficient and powerful software boosted it to the front of the pack, causing major computer hardware companies to either fund more lucrative models or (as in Apple�s case) drop out of the market altogether. 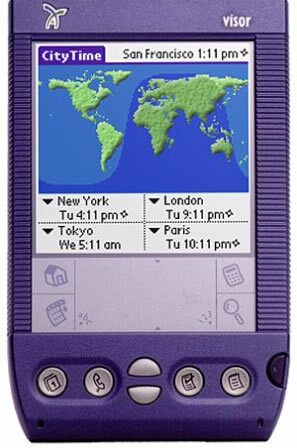 Six years later, Palm founders Jeff Hawkins and Donna Dubinsky left to create Handspring. 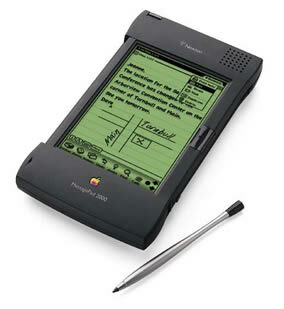 The move allowed them to develop something that astounded industry analysts at the time, a color PDA. As mentioned before, the PDA was originally intended for strictly organizational use. Well, Hawkins and Dubinsky had a greater vision for their new line of Visor handhelds. They sought to improve graphics capabilities, and as such, prompted Palm and HP to continue to add features to their competing models. 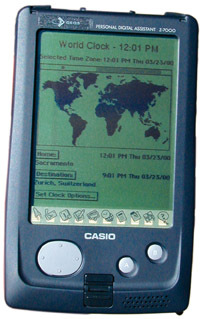 Increasingly, the PDA was no longer an object of organization, but seen as a potential media device as well.